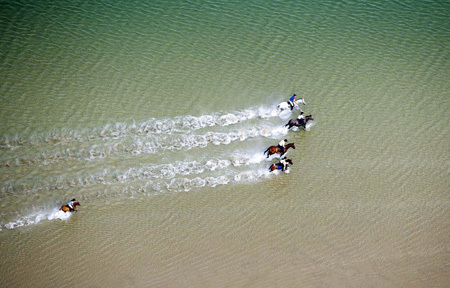 It’s a rare and spectacular sight in the West of Ireland – horses galloping at full throttle through the foamy fringes of the Atlantic Ocean. Scenes like this one, featuring riders from the Westport Woods Equestrian Centre, could be about to get more common, however. Locals have been liaising with Fáilte Ireland and others in an effort to develop a new post-to-post shoreline trail running parallel to The Great Western Greenway – a hugely successful cycling route that retraces the Achill to Westport railway line. The mooted trail could stretch from Westport to Mulranny and beyond, providing a big boost for equestrian tourism in the west.